As part of its long-term effort to build international partnerships in metal-related fields to help boost Taiwan's presence, Metal Industries Research & Development Center (MIRDC), a Taiwanese government-funded R&D institute, signed a memorandum of understanding (MOU) with the U.S.-based Performance Review Institute (PRI), a non-profit organization providing solutions to improve process and product quality, for cooperation on Nadcap. 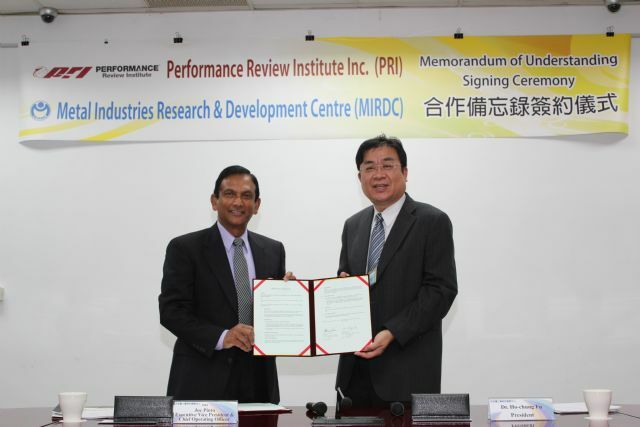 PRI’s chief operating officer, Joe Pinto (left), and MIRDC’s CEO, H.C. Fu, at signing of MOU on July 31 in Taiwan. Administered by PRI, Nadcap is an industry-managed cooperative program to establish stringent industry consensus standards, assure process familiarity and reduce redundant auditing throughout the aerospace industry. Witnessed by experts and insiders from Taiwan's aerospace industry, the MOU was signed by MIRDC's CEO, H.C. Fu, and PRI's chief operating officer, Joe Pinto, on July 31. The MOU calls for bilateral cooperation on establishing accreditation processes in compliance with Nadcap and providing training programs to assist Taiwanese firms to tap the global supply chain of aerospace components and parts. PRI's board includes such heavyweights as Boeing, GE, Airbus, Safran Group, Bombardier Aerospace, Honeywell Aerospace, Rolls-Royce and Japan's IHI among others. In addition to headquarters in Pittsburg, the USA, the organization also runs offices in the U.K., Japan and China to provide customer-focused solutions worldwide.